No. No. I was clicking on my actual, Rorqual. 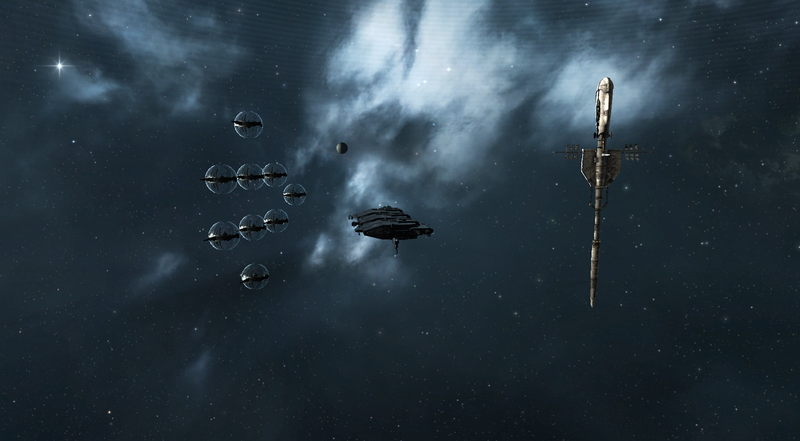 My Rorqual, Buttered Scone, who is fit and rigged. He is not a blue print but my tired mind had focused on the image of a Rorqual as my goal to click and build a blueprint. Hence, crossed wires and failure to produce. Baking Sheet was just pulled out of the oven today. He is a Charon and he was born in a low sec station for the goal of helping with capital production. We decided to create him because this billion plus ISK ship is the cheap alternative. How did I get here? How did I reach this land where I've decided to risk a billion plus ship as the smart and easy thing to do? The journey was rather easy when the other risk was six billion ISK ships if one used the jump freighters, two billion ISK ships if one used the Rorqual, or twenty some trips per build if one used the Deep Space Transport. I only have but one heart and it was having fits every time I warped a jump freighter about space, even from a station to a POS. This is also a direct side effect to changes like Crius and Phoebe. Using the arrays to decrease my mineral cost is an important part of bringing reasonable prices to buyers. The refining changes have caused sourcing and moving materials to matter. The jump changes mean home grown capitals are suddenly a greater asset then ever before as well as the general uptick in capital usage usage that I've been seeing. This part of Eve is important as well. I could only write about fleets and PvP. But there are so many things to do. So many people don't see low sec past its gatecamps and flashy pirates destroying everything. It is more. It can be more. It just takes people for it to be more. It is not that those things are a lesser thing. It is that they are one of many things that make up the every day. Most of my mornings are composed of a few cynos to get market goods into system. My afternoons installing and moving builds while I miscount minerals and make sure the POS fuel is topped up. It is almost amusing how much time it takes up. Almost. When I saw the title, I clicked instantly, hoping to see Pixie Vixen in an Avatar. But a freighter is nice too. But why Charon? Do you need that extra cargo space instead of the faster align of the Fenrir or the extra tank of the Providence? Save me from super carriers. I like nu pilots too much. Its absoutly the cargo space. I use a providence in high sec. I use a Rhea to jump. Thus ship warps between station and a pos moving minerals and hauling capital parts. Cargo space matters.